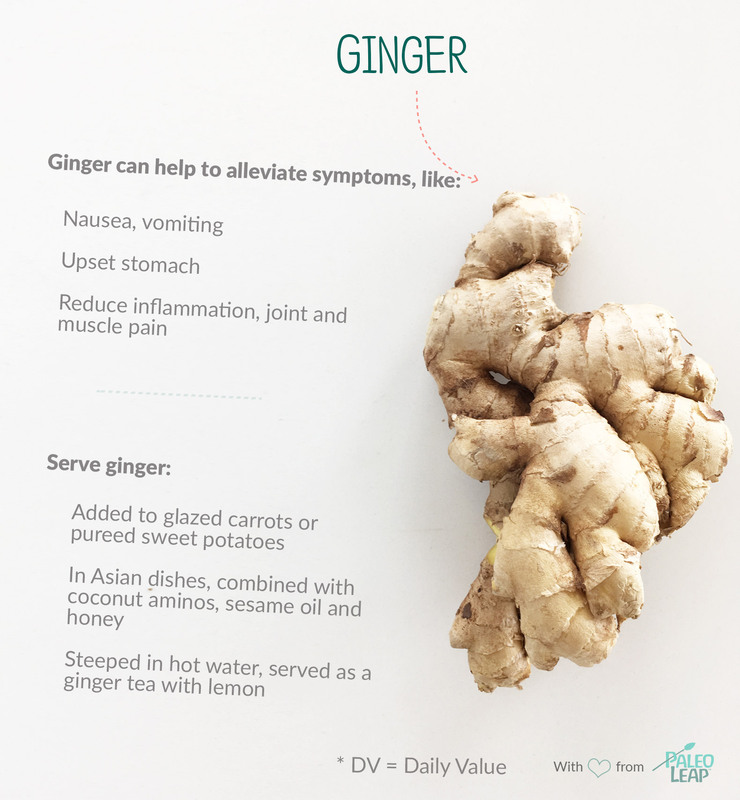 Ginger root, or more simply ginger, is an aromatic and spicy root that is often found in Asian dishes and commonly used in alternative medicine. Ginger is well known for alleviating a host of symptoms, like nausea, vomiting and an upset stomach. Ginger contains anti-inflammatory compounds called gingerols. These anti-inflammatory compounds have been shown to help reduce muscle pain after exercise. It has also been known to relieve joint pain and stiffness associated with osteoarthritis. Orange dots show how 1 ounce of ginger fits into the typical nutrient profile of a Paleo meal. PURCHASING: Fresh ginger should be firm and free of mold. Mature ginger has a tough skin that requires peeling. FRESH OR DRIED: Fresh ginger contains higher levels of gingerol, ginger’s anti-inflammatory compound. Dried, powdered ginger contains less gingerol, but has a longer shelf life. STORAGE: Whole, unpeeled fresh ginger can be stored in a resealable plastic bag in the crisper drawer of the refrigerator for a few weeks and up to a month or so. Add a bit of grated ginger to glazed carrots or pureed sweet potatoes. Combine ginger, coconut aminos, sesame oil and honey, then pour over beef or chicken. Steep grated ginger in boiling water and add lemon juice and honey for a hot ginger tea. Add grated ginger to a paleo-friendly muffin or gingersnap cookie.